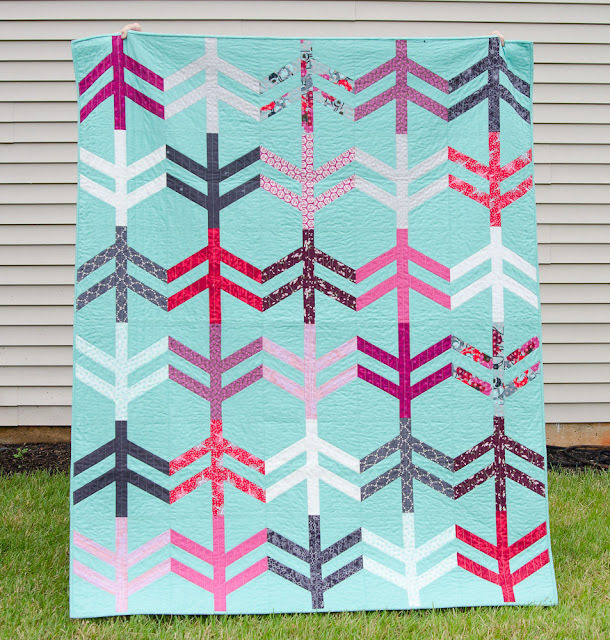 My latest quilt finish is a quilt named "Fletching". 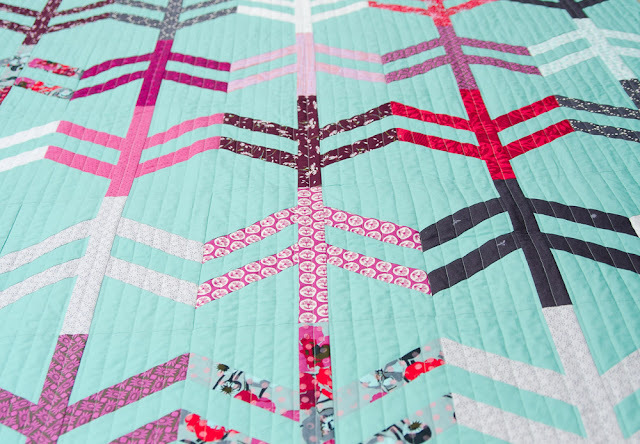 The pattern is found in the book, Scraps, Inc. a book of 15 scrap inspired quilts by various designers. The design is an interpretation of fletchings or feathers, at the end of an arrow and was designed by Amy Friend of During Quiet Time. I've had this book for a couple of years and this is one of the patterns that's been on my radar, waiting for the right colors and fabrics. This Anna Maria Horner print was the inspiration for the colors I used in the quilt. It's one of my favorite prints of hers and when I found it on sale, I bought a lot! It made a great backing. I also had some yardage of the solid Free Spirit Jade that complimented it perfectly. To be honest, I wasn't sure how this color would work for a background, but I decided to give it a try and ended up being pretty happy with the results. I pulled coordinating colors of fuchsia, plum, red, gray and white from my stash and pieced the blocks. They are paper pieced, but such a simple design. They came together fairly quickly and were perfect for using my freezer paper piecing method. When it came time to quilt the top, I had just attended a lecture by Cheryl Brickey at our Greenville MQG meeting called "Quilt As Desired". 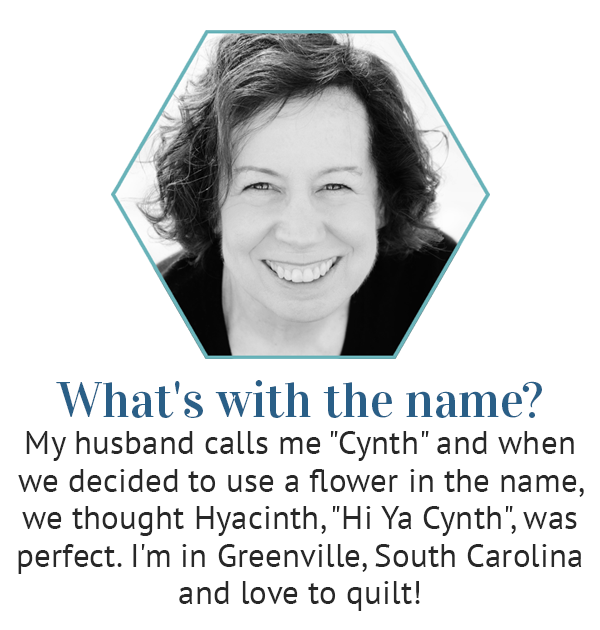 Cheryl gave us a logical method of determining how to quilt a top. 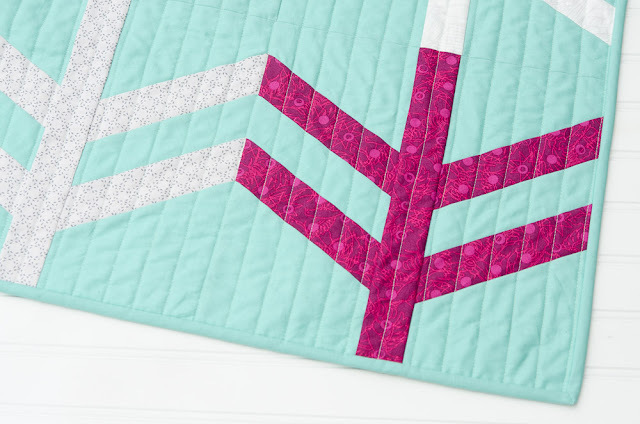 My first thought had been straight line quilting (I love how it looks and really kind of like doing it :) But I've been feeling like I use it too frequently and it may be taking the easy way out. So I went through all the steps, considered all the possibilities and ended up with straight line quilting! What do you think? I think it really compliments the piecing! My next dilemma was what to use for binding. I tried tons of options, reds, pink, grays and more. Nothing excited me and seemed to work. As I looked at the unbound quilt, I decided that really liked the way it looked without binding. A facing might have been an option, but I decided to go with the jade I'd used for the background. I've never bound (and that's a lot of bindings) with the background color, but I love how it looks! Will definitely consider that again! Be sure to check out the original quilt from the book - you may notice that mine is set a bit differently in the way the blocks are turned. I love when I can change things up a bit! This quilt is quite fetching! I love the background fabric you chose. It really makes the pattern stand out. Yes outstanding. You have done quite well on this quilt - including the quilting - after all that thought process :-) I agree that the binding being the same color was the right way to go. It allows the design to make a greater impact. Good job. Another wonderful creation! Love your thoughts about the process as well....what a pleasant read! 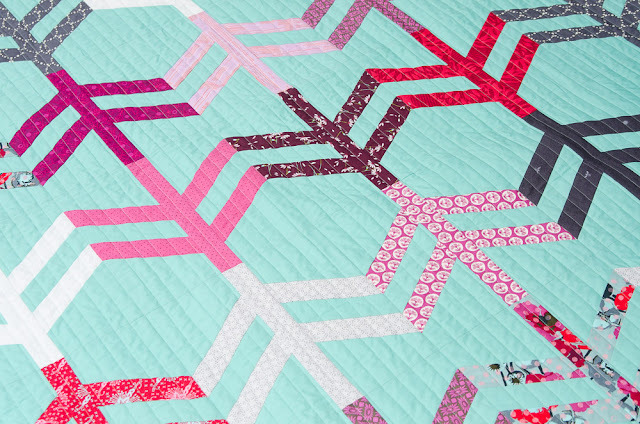 Really love this quilt, binding and quilting both just right and that backing print just gorgeous. Cindy, this quilt is so cool and pretty. I love the fabric, and the blocks, They kind of remind me of chicken feet, and dancing chicken feets LOLOL sorry. I love it though. I adore it. What a pretty and calming quilt. It's a pattern I have never seen before. 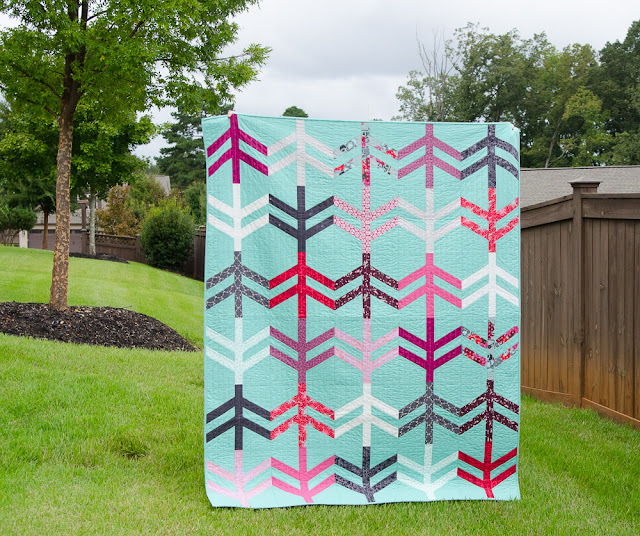 I really like it when a quilt color palette is inspired by a focal print, and it's fantastic you had so much of the print to use for the backing. I think the straight line quilting compliments the design very well and the binding is a great finish! Amazing quilt! I love the colors and the binding choice is perfect. Love your layout also very much, even better than the original. 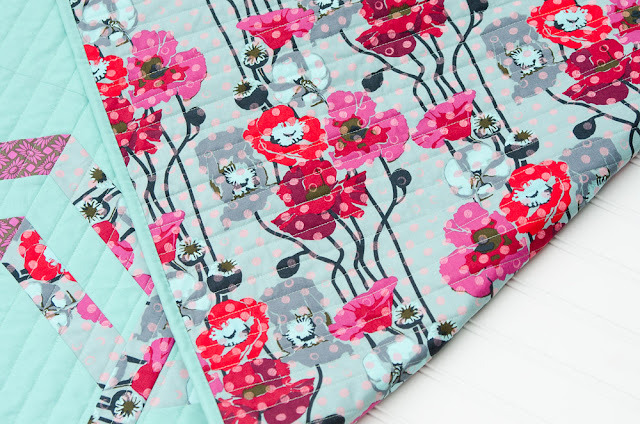 I admire simple quilting designs but struggle with deciding on one (simple) design too. Is there an online resource for "the steps"? This is wonderful. I'd just think of that straight line stitching as inspired by "straight as a arrow", it was a good choice. Beautiful finish! I love that backing print and the color you used for the background. You know, I skipped over this one in the book, thinking, not sure I really liked it. But after seeing yours, it is for sure on the "must do" list. Thanks for opening my eyes!